If there’s one thing we’ve come to know and love about Bahrain, it’s the country’s openness to embracing and inspiring its local and expat talents. And, the people who wave the flag for creativity, high and proud. FACT’s Shabana Adam meets one such team of individuals who are wowing the community, one colourful wall at a time. Meet the Dirty Hands Crew. From painted murals in 1950’s Latin America to the subways of 1960’s New York, and Paris’ Blekle Rat using stencil art for political messages in the 80s, street art has been around long before city-wide festivals were being held to celebrate this style of creative discourse. In fact, it’s only within the last two decades that street art has gone legal – in a majority of places, at least. As an artistic discipline, street art has evolved into a form of beautiful expression. Graffiti, stencils, prints and murals, large-scale paintings and projects of artistic collaboration, to street installations, as well as performance and video art, it’s clear as day that street art has worked its way into the core of the contemporary art world. And, it’s finally getting the attention and recognition that is so deserves. For those who may need a little recap on what constitutes as “street art” – here’s a fast refresher: street art is visual art created in public spaces, usually outdoors and usually unsanctioned artwork, that is executed beyond the context of traditional art venues. Now, in 2018, there seems to be a shift. Street art has taken on a life of its own – it’s trendy, instagrammable and, often, pure genius. The tables have indeed turned and many places around the world are now commissioning, or at the very least encouraging, street artists to fill the sides of desolate buildings, walkways, and neighbourhood walls with a vibrant image. And, though it may not be some cool, concrete highrise in a gritty part of Vienna or an artsy district in Colorado, this island that we all call home is packing its own adventurous facades that now act as a canvas for anyone who’s gifted with a spray can. Even the famous eLSeed has covered the curving walls around Bahrain Bay in his signature graffiti. Being huge supporters of local talent, and individuals and groups who are out here representing a new wave of creativity, there was excitement in the air when we came across the Dirty Hands Crew (DHC). 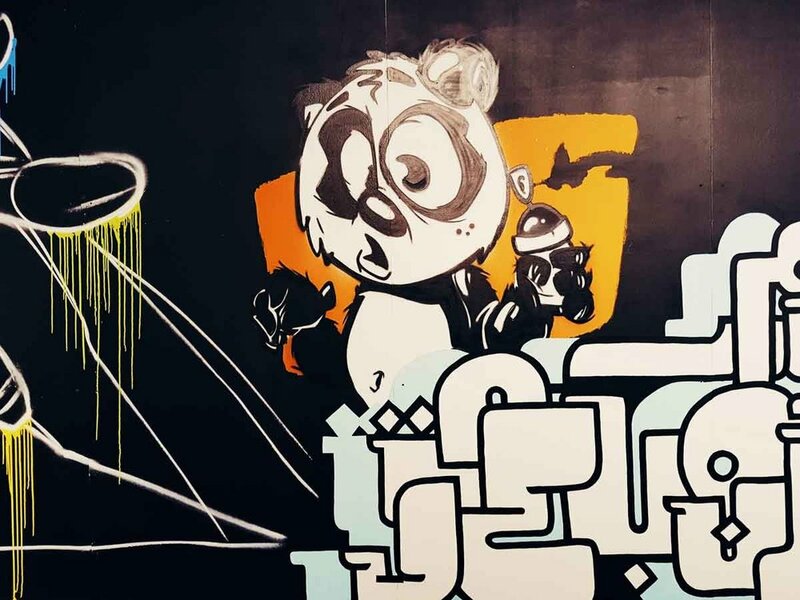 A strong unit of five friends and street artists, the crew is the first-of-its-kind in Bahrain and is openly sharing their love of creating big-scale, wow-worthy work with the public. The members of DHC are: Mustafa Halwachi (El Khal), Sarah Ridha (Monkey Grip), Arnaud (Pure *ork), Kojak (The Lazy Panda), and Marylou (The Deadly Chick). Together, their styles combine everything from realistic potraits and Arabic calligraphy to street graffiti and cartoon characters. They are as diverse as they are passionate, which no doubt makes for a very exciting experience every time the crew gets to work on a project. “Street art is the cave drawings of our age,” Mustafa says. “It is a pure and bold art form that puts the artist to the real test – mentally and physically. It is very liberating to work on such a large format. It changes everything,” he continues. “Soon the little details don’t matter much when viewed from a certain distance. It’s about the big picture, all pun intended!” Often a challenge for the artist and a total pleasure for the viewer, we’re intrigued to find out what the DHC are hoping to achieve with their murals. “We are the very first street art collective on the island and we are honoured that our work has been well received and applauded,” Mustafa tells us. “Bahrain does not lack creative people, and I hope that we will inspire the next generation of street artists and for those already in the field to start appreciating the street art movement and even start their own wall art initiative,” he adds. Speaking of positivity, we must address the elephant in the room. It’s no hidden secret, but with street art also being used to depict messages and agendas for social and political reasons, there are still many that view its different forms in a negative way. Take graffiti for example, throughout history its association with disenfranchised youth or stigma of links to criminal activity makes it harder for some generations to encourage and accept it on their streets. What is the crew’s opinion on those who still view “street art” as an undesirable form of expression? Mustafa explains: “Graffiti and street art has been given a bad rep, and been stigmatised as the work of hoodlums and good for nothing lost young folk. To some extent that is true – I am absolutely against vandalism and destruction of personal property. “That being said, it is only a very small percentage. Most artists that work in the public domain are geniuses when it comes to choosing their spots, and creating a dialogue of visual rhythm,” Mustafa says. “In most countries now, especially parts of Europe, they have realised the importance of bringing life to a dead and bleak environment. So, they’ve assigned “free walls” for artists to come and paint as they please. “As an artist working out in the street and being a part of this amazing crew, THAT is exactly what we are after. We promote beauty, creativity, togetherness and the love for our diverse community through our work. The work speaks for itself and the energy attracts the positivity,” he adds. Now, let’s take it back to the beginning, how did the DHC come to be and where did that all-too-catchy name come from? It turns out that this group of passionate individuals were already friends and artists in their own rights. They did solo projects and always talked about how awesome it would be to work together on some collaborative projects, all the while carrying a mutual respect and admiration for each others’ talents. “I do believe it is all about timing,” Mustafa recalls. “A big project came along that could accommodate the five of us and we had the chance to blend our different styles together. It was a 120-metre long hoarding of a construction site that we were commissioned to paint. “We started the project and the buzz soon grew and since it was on a main street the work got noticed quite quickly by the media,” he smiles. “One day we were talking and saying how we are amazing as a crew working together and supporting each other. And the idea just exploded that we started thinking of names right away. I read a proverb that said, “dirty hands is a sign of clean money”, which reflected us quite naturally as our hands were always dirty.” And so, the Dirty Hands Crew came to be. 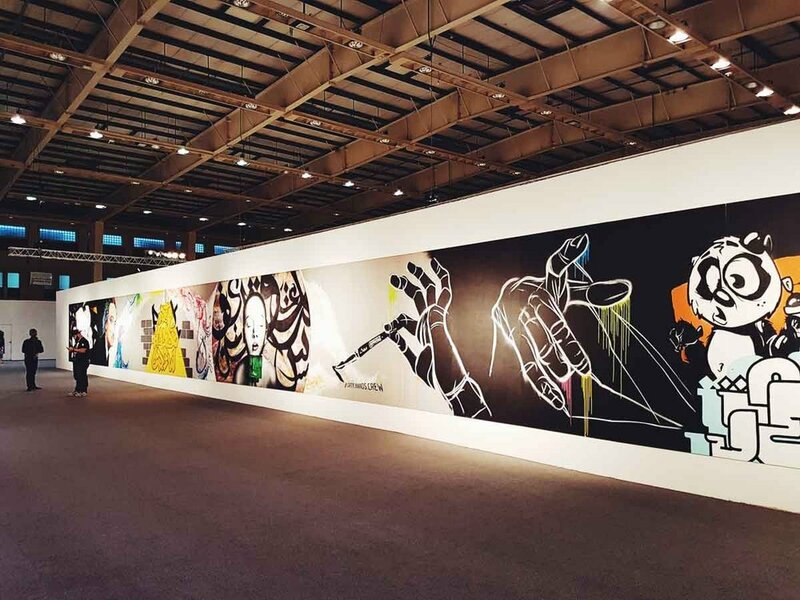 Hot off their success creating their first street art pavilion for none other than ArtBab 2018, a 30-metre wall inside the art exhibition, the Dirty Hands Crew’s main goal for 2018 is to keep pushing the street art movement, and a dream for a more colourful Bahrain. They also hope to gain the financial support of private entities that can help them to achieve this vision. If there’s one thing we’ve learned from getting to know more about these cool creators, it’s this: the crew that sprays together, stays together, and we’re sure that they will succeed together too.